Despite its restricted breeding range in eastern Siberia and northwestern Alaska, the Western Sandpiper is the most abundant shorebird species in North America with a population in the millions. It migrates to the coasts of North and South America, and is a rare spring and uncommon fall migrant in Tennessee. It can be found in areas where other species of shorebirds congregate from mid-April to late May, and from early July through mid-October. Description: This small shorebird has a short neck, a moderately long bill with a slightly drooping tip, a white belly, and the rump and tail are black. The back of breeding adults is scaled chestnut brown, and the breast is heavily spotted. The back and chest of birds in non-breeding plumage is gray-brown. Juvenile birds (March - August) are similar to adults but have a more scaly pattern on the back. Voice: Call is a thin, high, harsh cheet. 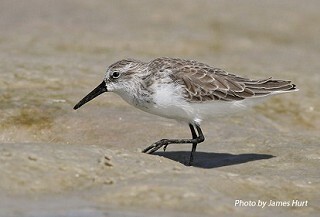 Semipalmated Sandpiper is very similar, but usually has a shorter, straighter bill. By late October, non-breeding birds may be very difficult to distinguish as bill length and shape varies among individuals. Least Sandpiper has yellowish legs, a shorter bill that also has a slightly drooping tip, and more distinct markings on the chest. Habitat: During migration frequents mudflats, lake and pond edges, and sandbars. Diet: Freshwater invertebrates, insects, small crustaceans, and mollusks. Nesting and reproduction: Western Sandpipers breed in eastern Siberia and northwestern Alaska. They have never been documented nesting in Tennessee. Status in Tennessee: Rare spring and uncommon migrant in Tennessee, usually found in areas traditionally used by migrating shorebirds statewide. Spring birds are typically found from late April through May, and from early July through mid-October in fall. Populations appear to be stable. In migration, this species forms huge, spectacular flocks, particularly along the Pacific Coast from San Francisco Bay to the Copper River Delta in Alaska. An estimated 6,500,000 individuals pass through the Copper River Delta during just a few weeks each spring. Best places to see in Tennessee: High-use shorebird areas such as Old Hickory Lake and Rankin WMA are good places to search. Wilson, W. H. 1994. Western Sandpiper (Calidris mauri), The Birds of North America Online (A. Poole, Ed.). Ithaca: Cornell Lab of Ornithology.